Throughout the month of December, during the season of goodwill, colleagues from ABP’s Humber ports have put their all into making a difference to charities based in their region. In total, it has been estimated that just over £1,500 has been donated by ABP Humber employees throughout this festive period. To kick start the month, the Immingham Container Terminal (ICT) donated 1,300 cans of rice pudding to the Christian Action Resource Enterprise (CARE) based in Grimsby and Immingham. The cans, which had been imported but were no longer needed, were collected by CARE at the terminal and will be used at the charity’s Daily Bread Food Larder for families living in poverty. 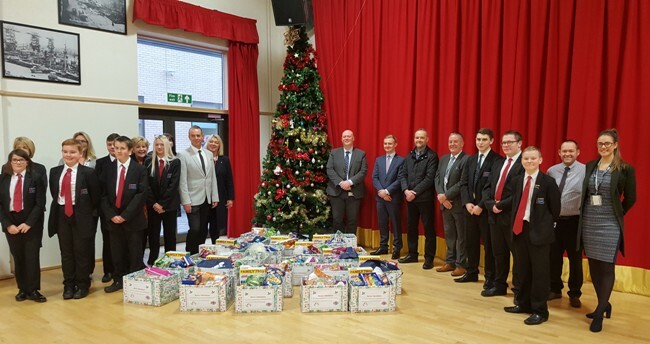 In Grimsby, Port Manager Ashley Curnow attended Ormiston Maritime Academy to help distribute hampers which had been put together through donations from ABP, IT@Spectrum and Townsend Electrical Services. The hampers, which contain fruit, vegetables, canned goods, desserts and ABP branded goodies, will be given to lucky winning students who took part in a raffle earlier in the month. Once again, ABP Humber took part in Cash for Kids’ Mission Christmas campaign which encourages people to buy and donate gifts for children from deprived backgrounds. Colleagues from all four Humber ports came together to drop off their gifts at Christmas trees which had popped up all over the estate. With over 50 presents donated by ABP’s employees the campaign, which was headed up by local radio station Viking FM, claims to have been able to give over 19,500 gifts to children in the region. Keeping up with the country’s festivities, ABP were no different this Christmas Jumper Day where festive knits were donned by colleagues in each department. Over £100 was raised for Save the Children, a charity that promotes children’s rights, provides relief and helps support children in developing countries. Whilst a number of organisations across the country will have taken part in various festive activities throughout the month, colleagues from the Humber ports maintained a cheery smile as they made a difference to their neighbours, whilst continuing to keep the country trading. ABP’s Humber ports are pivotal to the UK economy and keeps Christmas running smoothly. The container terminals in Immingham and Hull provide a whole host of gifts to be stocked in stores, giving the big man himself a helping hand with his deliveries. Biomass and coal handled across the ports keep one in ten of the country’s lights twinkling on their Christmas trees and from the millions of tonnes of fertiliser handled across the sites, crops will have grown to help feed families this joyous Christmas day. Unwanted Christmas presents? The DoubleTree by Hilton would like them to benefit York charity!